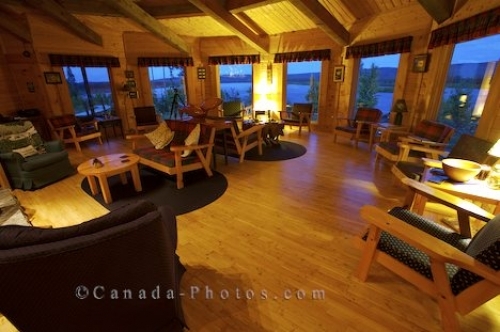 The windows that surround the lounge room at the Rifflin'Hitch Lodge in Southern Labrador are ideal for one to enjoy the wilderness scenery of the Eagle River. During the day enjoy the view from the lounge room at the Rifflin'Hitch Lodge in Newfoundland Labrador that overlooks the Eagle River but dusk is a superb time as the lighting is magnificent. Sitting by the windows and sipping a beverage is a relaxing way to spend an evening after a successful day of fly fishing in the Eagle River. Lounge Room at Rifflin'Hitch Lodge, Eagle River, Southern Labrador, Labrador, Newfoundland Labrador, Canada. Property Released. Picture of the stunning lounge room at the Rifflin'Hitch Lodge in Southern Labrador with a spectacular view of the Eagle River.